Ealing Council has launched a new initiative to deter burglars and reduce metal theft from churches and historic buildings in Ealing. 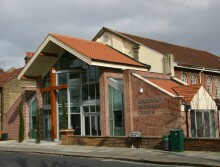 Kingsdown Methodist Church in West Ealing is just one of many examples. It's been targeted three times in the last few months and had thousands of pounds worth of metal stolen. The new scheme uses specially designed grease, which can only be seen under UV light, its applied to lead and other valuable metals used for roofing, windows and piping. Each tub of grease has a unique DNA style profile which directly links the metal to the building it has been removed from. The grease transfers to the thief’s hands on contact and is practically impossible to wash off. It can link the thief to specific pieces of metal, if they get recovered, and to the individual crime scene. It is also easily transferred to other parts of the body without being highly visibly and can be forensically analysed and used as evidence in court. Councillor Ranjit Dheer, cabinet member for Safer Communities, said: “Property marked with this grease will automatically become less attractive to thieves, because they and the person they try to sell the metal to can easily be linked back to the crime.